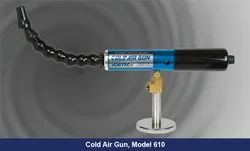 Our product range includes a wide range of vortex tubes and cold air gun. Vortex Tubes are an effective, low cost solution to a wide variety of industrial spot and process cooling needs. With no moving parts, a Vortex Tube spins compressed air to separate the air into cold and hot air streams. While French physicist Georges Ranque is credited with inventing the vortex tube in 1930, Vortec was the first company to develop and apply this phenomenon into practical and effective cooling solutions for industrial use. Vortex Tubes have a very wide range of application for spot cooling on machines, assembly lines and processes.